Armed Forces Director Keirsten Hess, left, offers a Girl Scout Cookie to former Army Airborne Private First Class Steve Hamlin. As several white-haired veterans file into the dining room, Keirsten Hess kneels to greet each one, crouching down beside their wheelchairs to offer hugs and whisper warm welcomes into their ears. 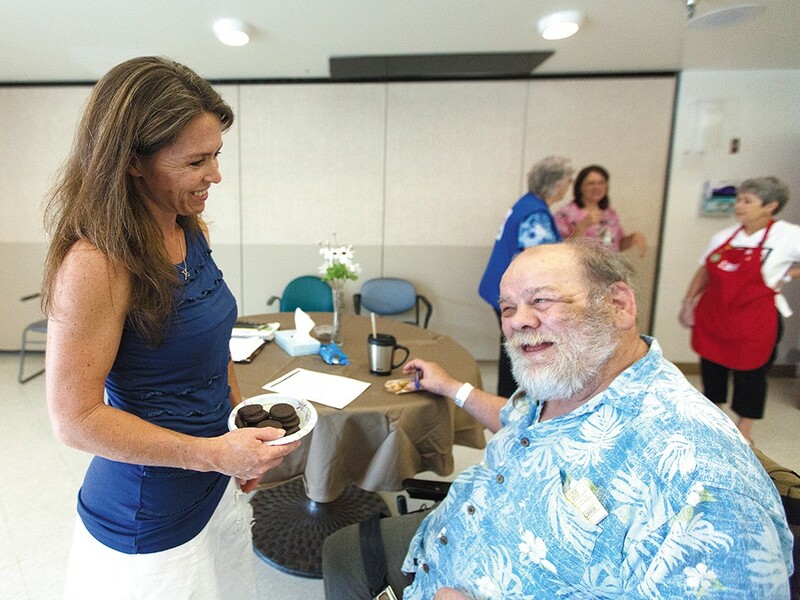 With a wide grin, Hess beckons them by name, calling them in for a monthly ice cream social at the Spokane VA Medical Center. Cookies, nuts, cherries and other toppings sit stacked on a nearby table. Taking their orders, Hess piles scoops of ice cream and toppings into their bowls. Other regular volunteers, including her mother and teenage son, step up to help distribute the treats. “Grab a bowl and grab a vet,” Hess tells them. As the regional director of the Services to Armed Forces program with the American Red Cross, Hess coordinates a number of support, outreach and social projects to assist military veterans, active-duty servicemen and women, and their families. Lively music starts up from a piano against the wall as more than a dozen veterans chat with volunteers over heaping dishes of ice cream. Finally slowing down for a moment, Hess scans the dining room to make sure everyone has been served. She smiles. “Getting to do things like this is really the best part of my job,” she says. Hess, a 42-year-old mother of two, has strong connections with the military community. She spent half her life as a military spouse, living on and off bases. Her oldest son and daughter-in-law, Jake and Bridget Hess, also recently shipped out to Afghanistan with the Marines. “It’s pretty cool to be able to kind of build a program from the ground up,” she says, describing it as an incredibly challenging but rewarding experience. Hess oversees many of the program’s social events, such as the monthly ice cream socials and barbecues at Fairchild Air Force Base. The program also offers a variety of classes on reintegration into civilian life, coping with deployment separation and other challenges. For troops overseas, the Red Cross also provides a vital emergency communications relay, helping facilitate messages between service members and their families during times of crisis. “We have a ton of programs,” Hess says. Megan Snow, regional communications director with the Red Cross, calls Hess a hard-working advocate for veterans and military families. Coordinating a wide range of programs, Hess often scrambles from Fairchild to the VA Hospital to the downtown homeless veterans shelter. Bret Bowers, the public affairs officer for the local VA hospital, says Hess understands the unique demands and challenges affecting veterans and military families. Her personal experience allows her to develop close connections with the people she serves. Bowers says it’s typical to see Hess deliver a truckload of donations to the homeless shelter one day, then make her rounds visiting residents at the VA hospital the next. He says her energy and dedication never waver. Prepping the ice cream dishes and toppings, Red Cross volunteer Jeanne Lind motions to Hess, a small blur of brunette hair hustling between the tables. “There’s a lot of energy in that little package,” Lind says. After serving local families for nearly five years, Hess continues to work harder than ever, Lind says. She serves as an inspiring example of the difference an individual can make in his or her community. During a rare minute of rest in the hallway outside the dining room, Hess reflects on the many people she gets to work with and help out on a daily basis. She says society often dismisses its elderly veterans without recognizing what they have to give. Many exemplify a sense of service, Hess says, living in a way that demonstrates generosity, caring and an appreciation for the small moments that mean the most.